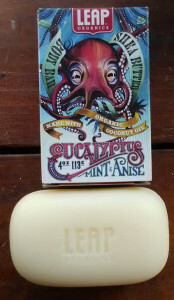 The combination of Leap Organics Eucalyptus, Peppermint and Anise Soap is undoubtably one of the best scent and oil combination that I have washed with to date. Everything about it is, clean and pure. Eucalyptus, Peppermint and Anise combination is almost like a Vicks Vapor Rub in the sense that it will clear your sinuses and awaken your smell senses (olfaction) and soul. Soap rubs on super silky and you can really feel the moisturizing power of the Shea Butter and Coconut Oil. The peppermint and anise oils remind me of a cocktail that I use to drink in the south of France, during my summer vacations, while playing Pétanque (a french game kind of like bocce ball) with the locals. The cocktail in question is, Perroquet. Organic Palm Oil, Organic Coconut Oil, Sodium Hydroxide (Not in Final Product)*, Water, Vegetable Glycerin, Organic Shea Butter, Peppermint Oil, Eucalyptus Oil, Organic Anise Oil, Sodium Citrate. How important is Organics in soaps? Believe in it. It’s that important and if you don’t go organic at least try to go with all natural ingredients and avoid things like titanium dioxide and colorings. Why? Because your skin is an organ and it deserves the best. Buy it @ http://www.leaporganics.com/ and check out the cool graphics and the whole organic line that “Leaps’ most brands behind” (just made that one up).